Yeah mon! 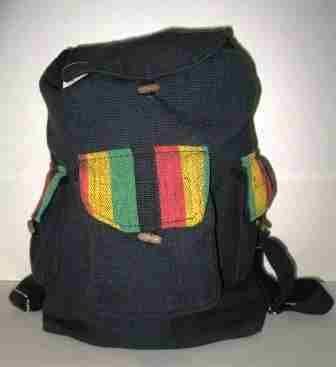 Dis rasta backpack hold many tings. 100% cotton from a fair trade coop in Nepal, this rasta backpack measures approximately 18" x 20", and has 3 outside button close pockets, so there is plenty of room to hold everything. The top has a drawstring closure with a button over flap for added security. Backpack straps are adjustable. Great as an overnight bag or everyday bag at school, or just perfect to lug around all your "stuff". Love it! it is a cute backpack that is very durable!